Need to spray the stink bugs out of your yard? You've come to the right place! Recommended accessories you may need in your quest for stink bug eradication! We're no stranger to rating Bifen products favorably, and that's because this company creates an effective product which works, plain and simple. 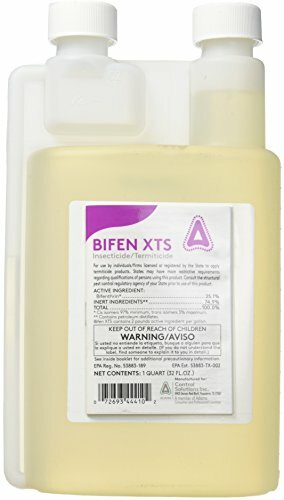 In previous product guides, we have recommended Bifen I/T, which is a gentler version of the same formula with a milder concentration of the active ingredient—coming in at just 7.9% bifenthrin. However, for stink bugs, we recommended Bifen XTS—with this formula, the active ingredient bifenthrin is concentrated at 25.1%, which is over triple the fighting power to knock out not just stink bugs, but around 50 other types of garden pests. Bifen XTS can be used as a termiticide (to kill termites) as well as an insecticide (other bugs), and is recommended mainly for outdoor use in all ornamental turfs. We love this spray because it's an impeccable all-around insecticide that kills the stink bugs without killing your budget, and can be used for several different types of pests for many seasons to come. Make sure to also pick up an easy pump sprayer to apply this stuff around your yard. We recommend the Chapin to get the job done. Want something more ready out of the box? We also recommend the Terro Stink Bug Aerosol Spray for a more handheld approach. If you're curious about stink bugs sprays and want to read more about the other products we analyzed, check out our full guide below! Want to skip all this research and just hire a decent exterminator for your stink bug problem? What's In This Product Review? Neem Oil: What's the Deal? Do I Need Any Other Accessories? Currently, the US Environmental Protection Agency recognizes stink bugs not only as the invasive pests they are for homes, businesses, schools, and agricultural sites, but also as a non-native species which is difficult to naturally regulate. Due to its migration from the Asian continent in the 1990s, the stink bug has no innate predators. These pests breed at an alarming rate, covering an entire area swiftly. These bugs chew up any kind of crop they can find, decimating plants until the skeletons of the stalks remain. What kind of sprays can you use to control stink bugs, and stop this from happening in your backyard? Keep reading to find out! As tempting as it may be to launch any kind of insecticide you can find at these little guys, it's probably best to read the label first. In the year 2011, the EPA approved the use of the insecticide dinotefuran to join the ranks of azadirachtin and pyrethrins in the fight against stink bugs. Because of their immense prevalence, stink bug infestations must be handled with extreme care. Currently, EPA guidelines state that only these three types of insecticidal sprays are legal to use against stink bugs. Many insecticides which contain pyrethrins as an active ingredient warn against indoor use—at the very least, the warning labels advise to dilute the concentrations with more water than normal if you plan to take the risk and use the product indoors. However, as per EPA guidelines, there are very few specific pesticides labeled for use to target stink bugs directly. This is where sprays containing azadirachtin, or neem oil, come in handy: they're a greener way to drive off the stink bugs and safe for indoor use. Currently, the EPA and the US Department of Agriculture state that the best way to ward off stink bugs is to take preventative measures against them each year. How can you stink-proof your home? By taking these steps, you're already making your property far less accessible to stink bugs, who are likely on the prowl for a place to spend the frosty winter months. Here's a quick video to help you with spray locations. Here's also a link to the product he's using in the video. We mentioned neem oil to combat stink bugs indoors...but what is this stuff? Keep reading below for more info! Neem oil is, as you may have guessed from its namesake, oil which is extracted from the seeds of a neem tree, a type of fruit-bearing tree native to Southeast Asia. Neem oil is largely regarded as a natural and chemical-free alternative to insecticidal pest control methods—its natural composition works as an inherent pest killer and repellent. Read Also: Is Neem Oil safe? How Does Neem Oil Work to Kill Stink Bugs? Neem oil boasts a wealth of other benefits in the home and in the body in addition to its ability to fight off the stink bugs; making it a key player in your pest control arsenal. As you can see, the list of benefits to neem oil goes on and on. Grabbing a bottle won't just do you some good to control your stink bug problem; it may work wonders for your body, as well! With each insect spray we reviewed, you'll need to purchase an external spray nozzle if you don't already own one. These sprayers can vary in size, but most commonly, they are shaped like a barrel or a drum where the spray sits with a hose attached for administration across the yard or garden. We recommend something like this one: Chapin 20002 Multi-Purpose Sprayer. It's affordable, it's durable, and it's versatile for several sprays through many different types of tasks. Whether you're spraying your yard for stink bugs or fertilizer, this is the kind of nozzle we'd endorse. Our top recommendation for stink bug spray goes to Bifen XTS for its affordability, its effectiveness, and its name-brand quality. This concentrated spray is mixed with water manually by the user and sprayed through an external spray nozzle around the property to rid the outdoor area of any pesky insects which lurk around. It leaves no residue or fumes, and is safe for pets once dry. As mentioned earlier in the article, stink bugs are fast-breeding creatures that are difficult to eradicate, so a heavy-duty insecticide is the way to go to knock these guys out. This is why we recommend Bifen XTS: its higher concentration of bifenthrin will help to blanket a colony of stink bugs with the killing power required to take them out in droves. The sale of Bifen XTS is restricted in a few different states, and this product is not recommended for use indoors. Additionally, we do not recommend that you spray this product directly on vegetable gardens or anywhere that rainwater could easily carry the product to your crops. We recommend Bifen XTS who want an inexpensive, powerful way to get the job done. 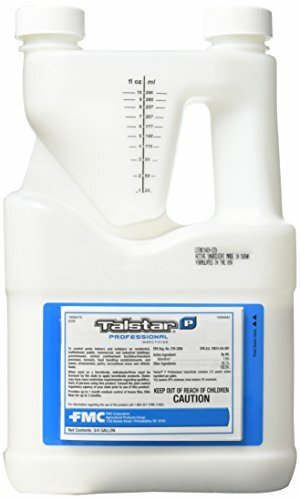 Talstar Pro has made a name for itself as an impressive insecticide and termiticide capable of killing over 75 different insects, and it lives up to the hype. So why is it our runner-up? Well, its shortcomings are twofold. Its first slight drawback is that it contains only 7.9% of the active ingredient bifenthrin, and when pitted against Bifen XTS's mighty 25.1%, this number feels quite lacking. Secondly, there's the price aspect. Not only is Talstar Pro is more expensive than Bifen I/T, a milder product which actually contains the same amount of bifenthrin, but it's more expensive than our top pick...which contains triple the amount of bifenthrin. However, we still rated Talstar Pro as our runner-up, because we can't deny its efficacy. Though it's a more expensive option, it's a trusted name brand which delivers on its promise to kill insects. You will need a spray nozzle with Talstar Pro as well, and it's recommended to only spray outdoors. One way to give stink bugs the boot without altering the balance of the ecosystem in your garden is to use neem oil. 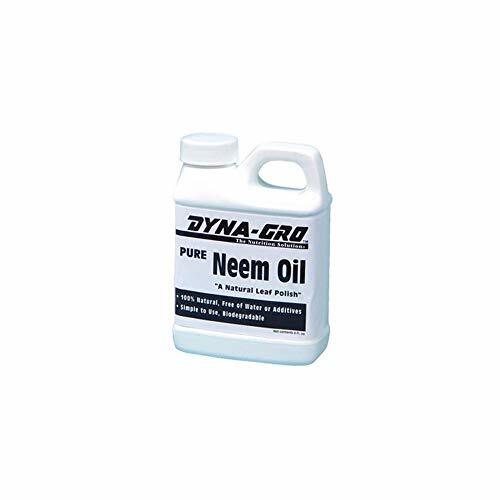 For those on a budget, we recommend Pure Neem Oil by Dyna-Gro: it's an eco-friendly way to keep your crops (and your wallet) intact. Dyna-Gro Pure Neem Oil acts as both a leaf polish for outdoor enthusiasts looking for a more aesthetically-pleasing garden area and also a pest control agent. Neem oil suffocates pests which would normally feast on leaves, whereas beneficial insects like ladybugs and honeybees (which leave crops unblemished) are left untouched. We love this product not only because it's a natural alternative, but because it's an awesome choice for someone on a budget. You'll need a spray nozzle, but not much else. We recommend Dyna-Gro Pure Neem Oil to those who not only want to save a few bucks, but are looking for a green alternative to pesticides, or perhaps want to look out for the beneficial insects which live in the garden alongside the pests. Organic Verdana Cold Pressed Neem Oil is the ideal solution for those looking for a completely green solution to an irritating and invasive problem. This product is totally natural and free of chemicals, which is a huge plus for those who are looking for something to use in the garden which won't harm beneficial insects or leave a toxic trail behind. Alternatively, Organic Verdana Cold Pressed Neem Oil can be used indoors as well, which makes it a dynamic product on the list. Stink bugs often overwinter inside homes, meaning that they take shelter inside during the brutal cold of the winter months. This product can combat stink bugs in the home, which is something that the chemical-based insecticides can't offer. In addition, this product can be applied in a variety of other ways—in terms of household and cosmetic uses. 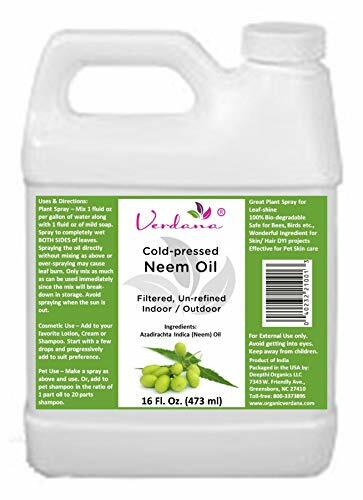 We highly recommend Organic Verdana Cold Pressed Neem Oil to those who are looking fora versatile product to knock out stink bugs affordably and in an eco-friendly fashion. Neem Bliss 100% Pure Cold Pressed Neem Seed Oil is another product completely derived from the seeds of the neem tree, outsourced from India. This oil is ideal for use indoors and outdoors to control pests in a green way—perfect for those who want to kill and repel stink bugs without the hassle and the risk of chemical insecticides. Neem oil is concentrated and should be mixed manually with water. Neem seeds contain the natural chemical compound Azadirachtin. which is one of only a small handful solutions approved by the EPA to fight against stink bugs. 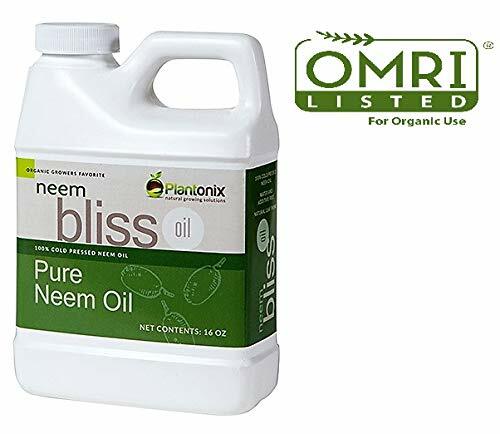 Neem Bliss 100% Pure Cold Pressed Neem Seed Oil works spectacularly as a pest control agent, as its purity infers that it contains nothing but Azadirachtin. We recommend this product to anyone looking for a harmless way to fight the stink bugs while keeping the rest of the ecosystem in balance around them. We can all agree—stink bugs stink. However, when you're on the hunt for a way to take them out for good, look no further. Regardless of the spray you end buy buying, you will need a stinkbug sprayer also. We recommend the reliable Chapin brand for easy pump application. Want something more handheld and ready out of the box? Curious about other stink bug related products? Check out our other detailed guides to help you deal with your pest problems.